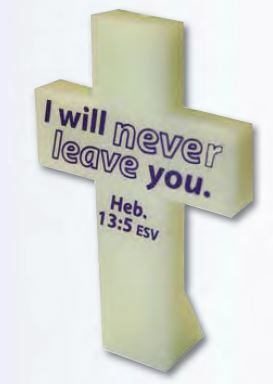 This glow in the dark cross comes with a built in stand designed for your mantelpiece or for a child's bedside table. The cross measures 2-3/8" tall x 1-5/8" wide. Glow in the Dark Cross is published by CTA and is our 74th best seller. The ISBN for Glow in the Dark Cross is TDMYC5XR. We gave these away last Hallowe'en and young and old loved and valued them. What a brilliant message to see each night! A small reminder of God's presence! After buying one of these crosses for myself I liked it so much I decided to purchase more of these for my family - it's a comforting reminder of God's presence.... I keep my cross by the light on my bedside table and after I've switched the light out at the end of the day.....glow of the cross is with me until I fall asleep. It's a big comfort in this dark world! Love this cross, sits near my bed and makes it more special by glowing in the dark. One of my favorite bible verses. Reviewed by Avril Smerdon . A glowing reminder that the Lord will ever be with us ! I SING IN NOTTINGHAM'S CITY CENTRE 6 DAYS A WEEK FOR JESUS [I REST ON THURSDAYS] AND WHEN PEOPLE OFFER MONEY I RECEIVE IT AND BANK IT IN A SPECIAL ACCOUNT TO BUY THINGS LIKE THIS AMAZING LITTLE CROSS TO GIVE TO PEOPLE. BOTH YOUNG AND OLD HAVE BEEN DELIGHTED WITH IT, AS IT IS A UNIQE REMINDER HOW MUCH JESUS CARES. MANY PEOPLE HAVE BEEN 'TOUCHED' ND COME TO TELL ME OF ITS AMAZING IMPACT IN THEIR LIVES. I ALWAYS CARRY SOME WITH ME...., THEY ARE AMAZING. I TELL PEOPLE TO PUT THEM BY THEIR BED, WHICH IS WHERE I HAVE MINE. IF I WAKE IN THE NIGHT IT IS THERE TO REMIND ME F JESUS' WORDS, RECORDED IN HEBREWS 13:5. It’s a constant reminder of what the Lord Jesus has accomplished for me on the cross...when I woke up in the middle of darkness and it glows! I buy these on a regular basis and give one to someone when they need love and encouragement. As they glow in the dark you can put one by your bed or hold it in your hand to remember the price Jesus made to give us eternal life. It help us remember that we are never alone. Got a question? No problem! 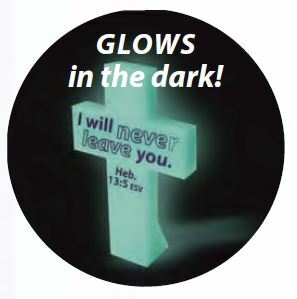 Just click here to ask us about Glow in the Dark Cross. A:Our customer services team will be able to find that for you. Just call the number at the top of the page. Thank you for using the Q&A Forum. A:If you email our customer service team at service@eden.co.uk, they will be able to find out for you. Sadly, I do not have that information. Thank you for using the Q&A Forum.